Agga Bai! : Why 29th August 2015 was specialer than all other 29th Augusts. Why 29th August 2015 was specialer than all other 29th Augusts. It was one of those days that make you want to mark it for the records.Nothing earth shattering, of course. Just some small, personal things. The kind that you want to look back on a number of times, and that just coincidentally occurred on one particular day. On 29th August 1953, a daughter was born to a wonderful couple with four sons. That girl would become my mother many years later. 29th August 2015 was her 62nd birthday! Or 26th, as she demanded, in a shocking pink kurta (made of China silk fabric that my dad had bought over 20 years ago from Dubai, and I was never fond of) that she had gotten stitched especially for the occasion, whilst cutting an equally shocking pink cake that I deliberately brought for her after seeing her new sartorial candour. 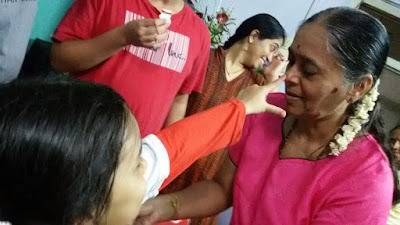 And Vi giggled with glee as she made neatly spaced pink polka dots with the cream on her Aaji's face with her tiny finger. The cake cutting ceremony was attended by all her dear family members- Dada Mama, Mothi Mami, Bhau Mama, Gautam, Prasad and Namita, in addition to Dad, Maitreya, Vi, Sam and me. 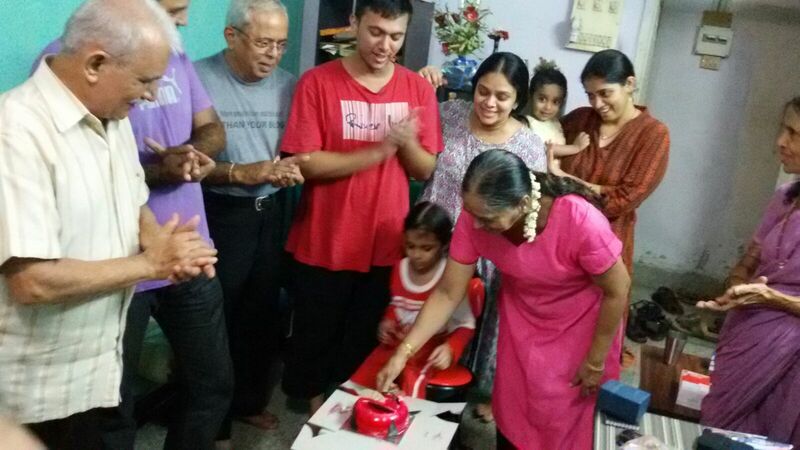 Here is wishing her the 'Pink of health'. On 29th August 2015, it was also Raksha Bandhan. But did I not mention this year, it was specialer? It was because my baby brother Maitreya was now old enough to buy me gifts from my wishlist with his very own salary. My two other fab cousins, Gautam and Prasad also made me richer with money and with their Rakshas-like presence in my life. I've been calling this festival 'Rakshas Bandhan' for a while now. (Abhi, you were remembered, but my 'vasooli' is overdue!). 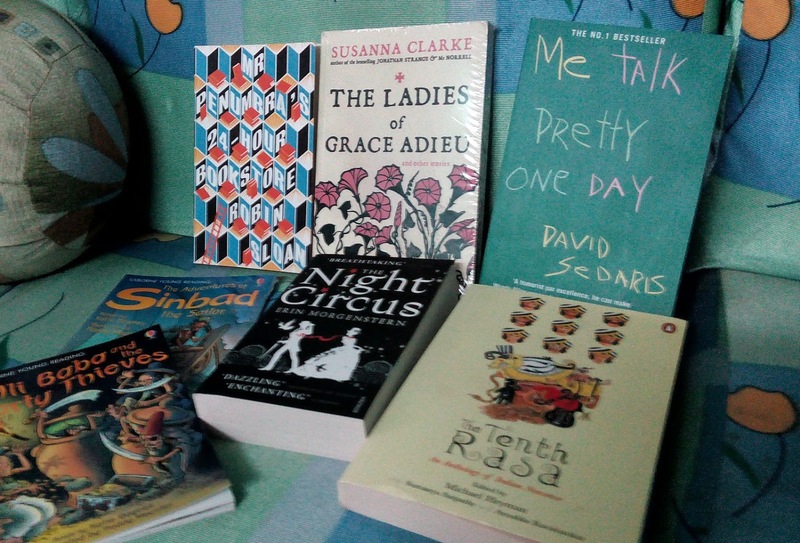 Vi was happier too because her cousins, Aahan and Saksham, gifted her books, a Transformer mask and art materials. 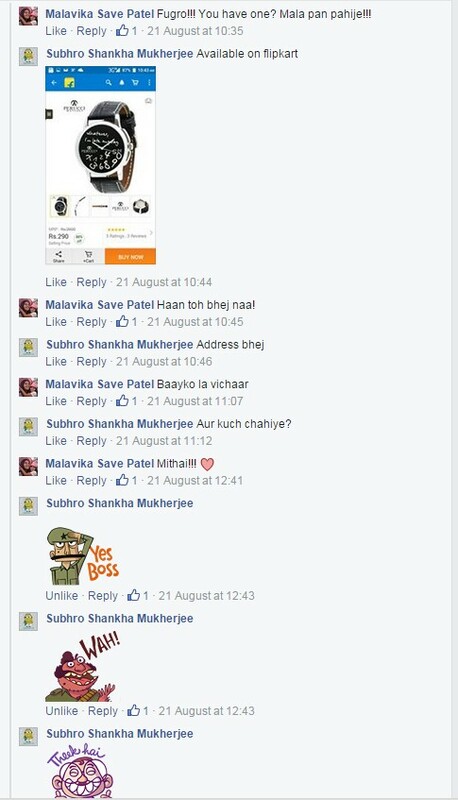 On 29th August 2015, My darling, sweetheart, beloved Fugro ensured that a watch arrived for me that was the direct consequence of a Facebook conversation (see images below) and had *absolutely nothing* to do with the word 'brother' in relation to him! I laaaabh you, Fugro! Muaaaahhh!!! Vi and her Mamu also wrote about a "Life Event" (no idea where she gets these ideas from). Needless to say, Vi won. 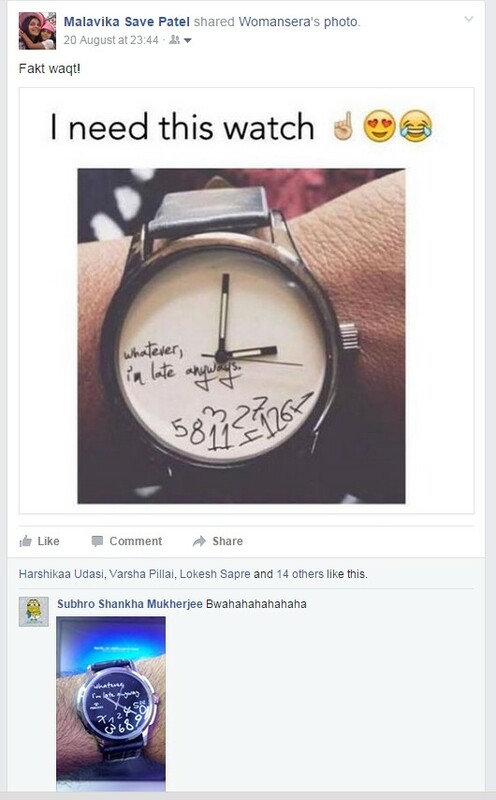 Mamu *REALLY* needs to get a life! Expo. 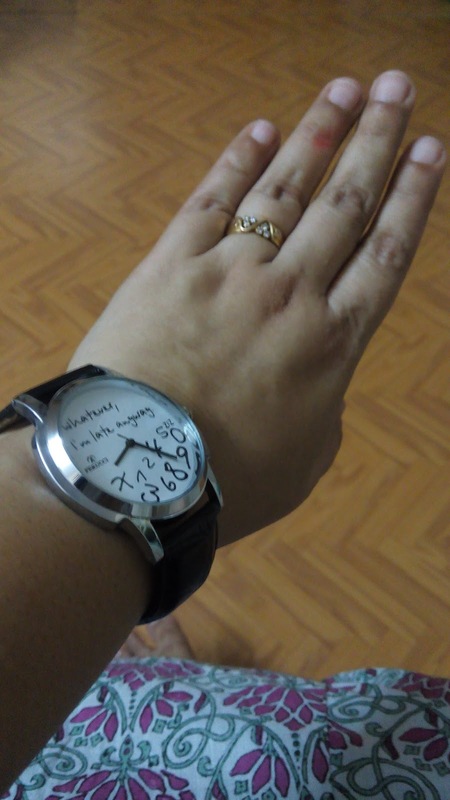 And I aim to wear it this Ganesh Chaturthi. 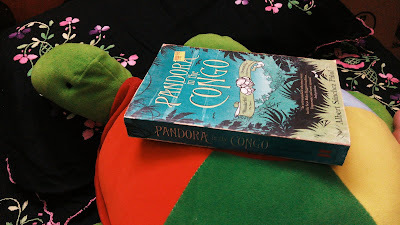 On 29th August 2015, I finished reading Pandora in the Congo- another purchase on whim, made just 5 days earlier, and more importantly without *any* references, recommendations, or preconceived notions of the story or the author, whatsoever. And I thoroughly enjoyed it. So here is to being more adventurous with selecting books! Honestly, just pick a book and read it. On 29th August 2015, Samir arrived at 10:00 pm overloaded with parcelled food, and we remembered the times when street food was prohibited at home and Chhaya-mami was outraged that Bhai Mama brought home parcelled kebabs. "Unhygienic! Don't I cook well enough for you at home?" 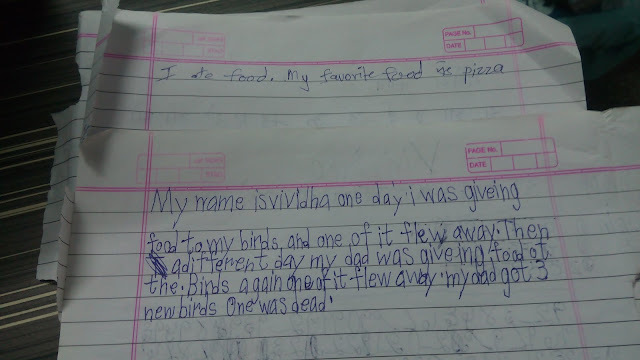 On 29th August 2015, it was also the day Vi not only ate a sizeable dinner by herself for the first time ever, but also tried to convince her older 9 year cousin to try some food, all the while insisting how good it was. Being an exasperatingly picky eater who is never *ever* hungry, this was no mean achievement on her part! On 29th August 2015, us cousins sat on the floor in the living room and reminiscenced about the parents' generation and their ritual card games when we were kids. Prasad and I remembered how we spun the rotor blades of a toy helicopter on Bhaimama's head, consequently leading him chop off the entire entangled lock. And how Janutai, Dipoo, Pooja and Maitreya are the only competent card players of this generation, having been mentored by Dada Mama and Nana. 29th August 2015, it was also the 9th death anniversary of Nana who left us this day on 2006. The grandfather who raised us all with stories of the epics and with morals and values that were far ahead of his time. He raised his daughter and grand-daughters no different from sons and grandsons. He prided on my eldest cousin Janhavi and dedicated a poem to her claiming her to be the Kuldeepika (and "brighten the family name" she did, with achievements at national and international levels). When the country went berserk feeding milk to idols of Ganpati, and we, kids, could not contain our excitement, he simply eased back in his armchair, raised the newspaper to his eye-level and proclaimed "Surface tension". I was in the 10th, and attending Science classes at my class teacher's residence when there was a spell of heavy, unseasonal showers. We called our homes from the landline (cellphones weren't even heard of, back in 1993) to inform we'd be delayed. My over-protective Aaji panicked and promptly sent Nana to bring me back home. When this tenacious 75 year old man knocked the teacher's door, having walked 20 minutes in that pouring rain carrying a spare umbrella, the 15 year old me was embarrassed yet emotionally overwhelmed and absolutely proud of being his granddaughter, whilst my friends watched (with envy, I should think) as I stepped out with him. You write well. Very well. I wish I could express such simple things so easily. You are being too kind and you know it. Very Well written indeed!! Enjoyed reading it!!! So natural and beautiful!!! Loved reading it!!!! You are awesome bhabhi!!!! !